Deer Carved Dart Board – Handcrafted Custom Game Cabinet. 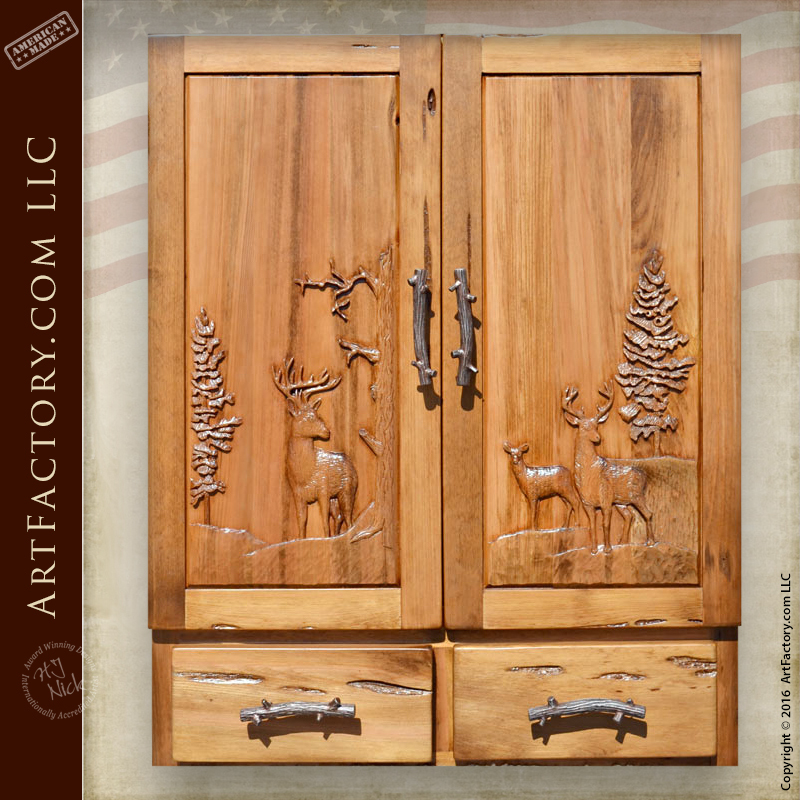 This solid wood game room cabinet features a custom dart backboard. Also double doors each house a scoreboard and dart holding shelf. Below the dart board are two additional drawers for additional gaming device storage. This high-end designer dart board cabinet is hand built using mortise and tenon joint construction, all American hardware, and completed with a 10-step hand applied finish for a virtually maintenance free wood furnishing. Our master craftsmanship ensures your custom cabinets will become a valuable family heirloom. So Contact ArtFactory.com to order your investment quality dart board cabinet custom made just for your Game Room. Fine art 10-step hand rubbed process, finished to world class antique collector standards, therefore no spray on faux fast paint jobs. Designs By H. J. Nick and ArtFactory.com, an American manufacturer of handmade custom furniture based in Scottsdale, Arizona have been designing and building some of the world’s finest furniture for interior designers with ordinary clients as well as more prominent and successful individuals. Also C.E.O.s, leaders, royalty and celebrities for over 100 years.